The Gentleman Crafter: Scorpion Bite! Just got bit by a scorpion on my toe!!!! Of all things to bite me! Warning! Squashed bug picture! MAN it stung like the devil itself! Blast! Here is the little guy that caused all the commotion! LOL! See, I knew you would be interested! NOT! OMG HOW DISCUSTING!!!!! I was on Laura's show well everyone went nuts. I hope your ok, now we need a picture of the toe! Proof!! Are they poisonous? I hope the sting goes away and your ok.
omgawd, that is awful. Glad he's dead...and hope your tootsie is ok! Sorry Jim. We get them also and I am terrified of them. They are so fast!!!!!!! I hate them. Not big on anything thing in the insect line!!!!!!!! Take care. That bugger didn't know who he was messing with did he. LOL! Hope it hurt as much as it hurt you. Good Lord Boy!!! That's a big bugger. Glad he is dead!!! Hope your toe is OK. We need a photo of it too. LOL Love Ya!!! Wow! You gave us quite the scare. Glad you are ok, and he is not! I hope that your stomach doesn't stay queazy for too long. I have been stung by one so I know the feeling. We are waiting for a picture of the toe. Yikes!! We were all worried about you while watching Laura. From the looks of him, he won't be bothering you again!! big OUCH!!! Time to call the bug exterminator man! See, this is just another reason not to live in Texas! I have successfully lived my whole life without seeing one of those in the wild. We do have brown recluse spiders though. I do see them often at my parents. Uck!! We have the brown recluse spiders where I live in N. Calif . . . a friend got bitten by one & ended up in the hospital for a month!!!! They are mean, nasty critters!!! Bite or sting?? Hope you feel better soon!! I can imagine the pain... I got stung by a sting ray last summer on my big toe. Now that is some serious pain. Remedy - immerse foot in hottest of hot water you can stand. It takes the pain away like magic. Don't know if it works on scorpion stings. Did you call the doc? I think their sting will make you very ill, or worse. Keep your shoes on Jim! Yuk! Hope you aren't seriously hurt Jim and I'm glad that that one won't be bothering you again! Oh my goodness!!! I was at Laura's show when it happened. All the ladies thought you were kidding at first and then got really worried. You are loved what can I say. I am glad that you didn't get bit by that other thing....we won't mention it. Hope the toe isn't too bad. OMG, that's sooooooo weird. 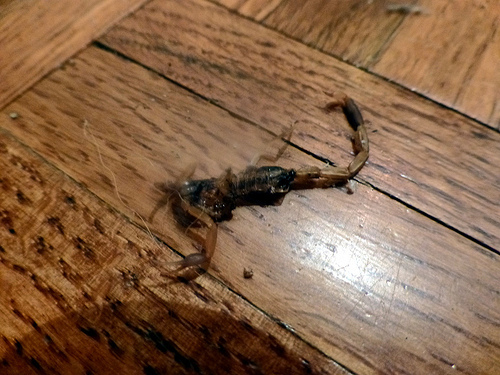 I literally just got stung by a scorpion about an hour ago. I pretty much freaked out because even though I live in AZ, I've never been stung before, and like you said, it stings and tingles like the dickens (still does). I even went so far as to call Poison Control just to be safe. At any rate, I sat down at the computer thinking I'd go through my Favorite Blog List to get my mind off of it and I opened up your blog and low and behold I saw a blog posting at the bottom titled "Stung by Scorpion", it was so coincidental and kind of weird. It really does hurt quite a bit. I'm so freaked out too because it was in my bed, under the covers. Even though I've now washed every stitch of bedding, I'm grossed out by the whole thing and I don't want to sleep in my bed. At any rate, your posting gave me some sense of comfort and it seemed to calm me down, thank you for that.